﻿ Don't DIY Your Washing Machine Repairs! Don't DIY Your Washing Machine Repairs! Now more than ever, the internet is chock full of people who claim to be experts on all sorts of things. The presence of these individuals, and the articles or videos they create, inspire those looking to save a little money to attempt to fix problems that could end up in more damage. A good example of this is home appliance repair, more specifically, fixing a washing machine. How much do you really know about how your machine works? Are you aware what causes the drum inside to spin? Do you know what parts to your machine are essential to its various settings and functions? If you cannot definitively answer these questions with confidence, then we suggest that you should not try tinkering around with the inner workings of your appliance as it can do a lot more harm than good. While it seems like a rather basic appliance, there are all kinds of pieces and parts that are essential for a washing machine to run properly. The improper installation or improper replacement parts in general could turn your machine into nothing more than a heavy hunk of metal in your laundry room. You aren't alone in not wanting to spend money for repairs, but you will have to spend a great deal more money to fix problems the machine didn't even have until you started trying to fix it on your own. We have a network of professional fridge repair technicians, who work every single day on fixing common and complex problems on everything from dryers to the washing machine in question. These experts are knowledgeable on all brands and models of these machines, and most importantly, what is required to fix them properly. 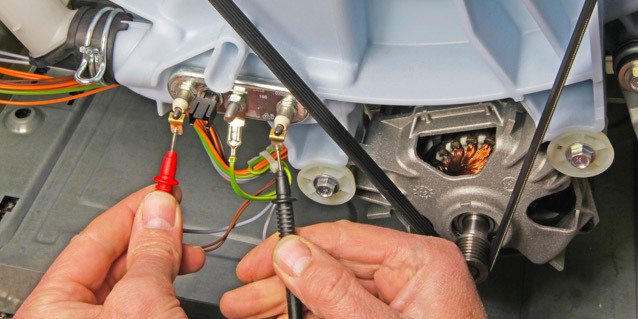 Since you cannot give yourself any sort of personal guarantee when it comes to trying to fix appliances on your own, it is nice to know that a professional outfit is going to properly repair the machine and offer you a 30 day guarantee that the problem has been fixed. There are all kinds of things that a person is best to choose when it comes to DIY projects. Attempting to repair machinery that you are not familiar with is never a good example of this. Consider for a moment why appliance repair companies exist. If it were truly so easy and simple to repair an appliance like this without professional assistance, then these companies would be non existent. Instead, they are putting their knowledge to use in areas where it can be dangerous or costly for inexperienced handymen to attempt repairs on their own. So before you psych yourself up watching videos on YouTube of someone showing you just how easy a repair to your washing machine is, you might reconsider your position on the matter. While it all might sound simple, every brand is different and the models vary as well. What one person finds when they remove panels might look entirely different on yours. It will ultimately save you time, money and frustration to leave the washing machine repair to us and we'll make sure we fix it right.